By the very nature of its conception, each year's Stone Beer is a little different. After all, it's brewed as part of a celebration at Stone & Wood's Byron Bay home, to which friends and family are invited and can get involved in the almost ceremonial process of building a fire large and hot enough to heat the volcanic stones that will be lowered into the kettle to add an extra layer of caramelisation to the finished beer. Yet, after changing the recipe around regularly in the early years, it would seem they've got the desired outcome pretty much locked in these days. As with last year's brew, the 2017 vintage is a 6.5 percent ABV dark ale – one so opaquely dark brown it could almost pass as black. And, again, it's a beer that balances sweeter chocolate, cocoa and dark caramel characters with an earthy, roasted bitterness, while we reckon there's some figgy dark fruits in the mix too. 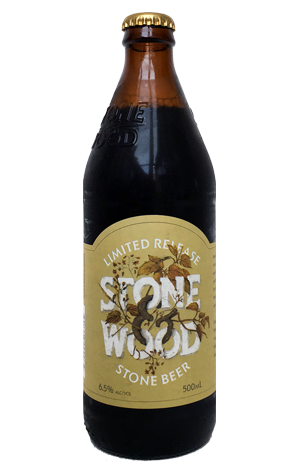 Most importantly, it has to be one of the most drinkable dark beers you'll come across this winter – another reminder of why Stone & Wood has gone back-to-back as Champion Large Brewery at the Australian International Beer Awards. You can also look out for limited amounts of a Lark Distillery barrel aged version of the 2016 beer and check out head brewer Caolan Vaughan talking about the Stone Beer concept.